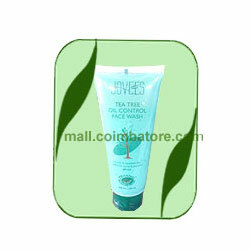 Tea Tree Oil Face Wash contains precious herbs & botanical extracts specially developed exclusively for oily & sensitive skin. It deep cleanses skin, removes excessive oil and helps to control acne & pimples. Moisten face. Squeeze out a small amount of Jovees Tea Tree Oil Control Face Wash on your palm. Apply and gently massage all over face in circular motion. Rinse well and pat dry. Use daily in the morning and evening. Follow with Jovees Aloe Vera Moisturising Lotion. Tea Tree Extract, Lemon extract, Vitamin-E, Olivem.